With the right preparation and simple guidelines, the time your team spends in meetings can yield profitable results. James Schramko with a business news update here. This week I’m going to talk about what you can do when you get together with your team. Many people myself included have a business team that aren’t in the same location. I work from home which is why you get these outdoor videos and I go and visit my team every 3 months. Now a lot of my students and other people have started to copy this idea at my suggestion and go and meet their team. You will always get really good results when you do that. Here are my suggestions to get the best value from your time together with your team. You can still implement this even if you’re in the same office as your team. Before you go and meet with the group of people in your business, everyone should know what the agenda is. So have a loose agenda. I use the Reminders App in my Apple device for this and I list down all of the things that I want to talk about. But tell each person what their topic is. Now here are some suggestions for what you can talk about so that when you come together, your time is best spent. Firstly, have the very best, most important people at the meeting, the stake holders who run your business. I generally have the top 6 or 7 people who run my entire business, the leader of each department. Some of the things we’ll do is actually conduct training. When we do training, we use the I, we, you method. That is I’ll do something and show them how it works, then we do it together, and then you do it. As in I do it, we do it, and then you do it and then I’ll just check and make sure that it’s right. I like to implement new processes on the spot using this simple method. The next thing is we have an innovation discussion and that’s where the power comes. I like questions like how can we serve our customer better? Because we have the lifetime customer model so we are always focused on the current customer we have. How can we be more relevant to the customer right now? What do we need to change with our products and services? What do we need to start doing? What do we need to stop doing? And that applies to all the tools and resources we use in our processes. And what should we do more of? In other words, what’s working for us right now? That’s what we want to scale and ramp up. At the end of this, we actually come away with a checklist and we have a revision meeting. So the whole team comes together, the team leaders at the end and we talk about the top 3 things that we’re going to do in each department and we all agree with the top 3 things and we each write them down as our own checklist. Then, what we do is the team leader will work on those 3 things and I will check on those 3 things and over the coming weeks and months and year, as those 3 things are rolled out really well, our business grows. So do less things but do them really well and be super focused on the top 3 things that you should focus on. I also recommend you build in a non-work component. We like to go to the movies, or the shops, or do some sporting recreational things. Playing at the arcades etc. You’ll find that people play the same way that they work and that’s a good way for people to communicate better. I know a lot of big offices put fun and recreational things in the office and that’s for a specific reason. You don’t want to be always work focused. Enjoy meals. Spend time together. Here’s my top tip, I would consider the fact that you’ve spent all of this time and energy and IP and process and hiring and training and stability. I will not be sharing and intermingling your team members with other businesses on too deep a level. I would keep yourself separate and focus on keeping that technology and that IP the way that you’ve developed it. That is your strength, that is where your profit comes. Would you like a low friction way to stay in touch with your customers each week? I highly recommend the process of making videos like this. Every single week I get reply emails saying thank you so much, you’ve inspired me to make videos, start a podcast or reach out to customers or I want to join your program because I’ve learnt so much about you. The way that this news video update is so powerful is it actually works with your before, during and after components of your business. It helps people get to know you before they do business. It really helps people who are doing business with you right now understand what’s happening with the products and services they’ve purchased. Then of course the post purchase follow-up. Even if someone’s purchased a service or a product before, they’re staying in the loop and they’re able to find out about new innovations. If you are innovating, as Peter Drucker would suggest you do, then you will continually develop new programs and even though you may not have the customer right now, they’re certainly ready to come back when what you have suits them. I highly recommend a news blog strategy for this. Now is the right time to book to come along to my SilverCircle Intensive Workshop on the 19th of September in Sydney. I have a special guest flying in from overseas, from the United States. I’ve got my very best returning customers from previous SilverCircle Intensive coming to this. It’s going to be held on location here. 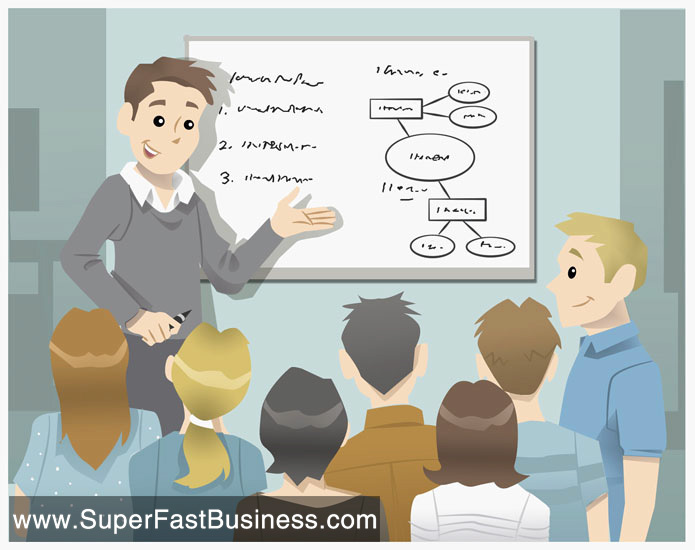 It’s a very small workshop, a very powerful workshop, and I’m certain there’ll be a return on investment because for your 1 day workshop you’re also going to get a 1 month worth of follow-up with me on a weekly group call with the other SilverCircle members. I hope I can see you at this event. What I will teach you is how I make these videos. Why I developed SuperFastBusiness.com. We go behind the scenes and have a look at all the statistics, the downloads, the views, the analytics and why I setup the marketing channels the way I did. And I think it’s going to be a lot of fun. The other thing that I’ve recently installed is LeadPlayer which is why you’ll see an opt-in to join my newsletter list straight after this video wraps up. So if you’re not on the newsletter, please join right now. You’ll see it pop up under this video right here.